As promised, a video from my walk with C...please don't attempt to learn Romanian from me. Also today, in Contemplation, we have Tuesdays Unwrapped where I share a bit about a play therapy session. He's also keen on filming videos. Hopefully I'll have those to share with you tomorrow! Make sure to take a look at Contemplation for this weeks 1,000 Gifts and Romanian Wifery for some 'crafty' things I've been doing, what I've been reading and listening to. it makes a girl smile. Several months ago, one of our little boys arrived at the center with a gift for me. Out of his pocket he pulled these large-ish sized earrings. Now, I'm a fan of big earrings...and these take the cake! He said he'd found them on a bench. The 'silver' was decorated with tiny sparkly-ish things, but one was missing and had grown a little rusty around it's edges. Honestly, my first thought was: tacky. My second was, I'm not putting these things in my ears! Who knows where they've been! But, his little scarred ear that rounded out the burns covering his arm and chest, his crooked elbow...all left-overs from neglect...they were handing me his gift and the pride in his amber eyes could not be dismissed. So, we grabbed some alcohol and wiped them clean and he watched on his tip-toes (really, he did...this is not poetic license) as I stuck them in my ears. I pronounced them great, gave him a hug, and he skipped away. she watched as I put this gift into my ears, and all day long kept telling me how beautiful they were. And, this gift, these words, those eyes, that pride of his, made me feel as if I glowed with their beauty, too. Have you ever dismissed something as tacky or dirty, when really it was this beautiful gift? Do you mind sharing your story? Today in Contemplation: a poem called Language Learning. And, in Romanian Wifery: my pants are too tight. Head on up to the pages above to read these posts! Two years ago, I moved to Romania. In that time, I've had to apply for permission to live here 3 times. The first two applications needed to be be renewed every year. The visa I received last year was good until the year 5010. Customs had a good laugh at that. 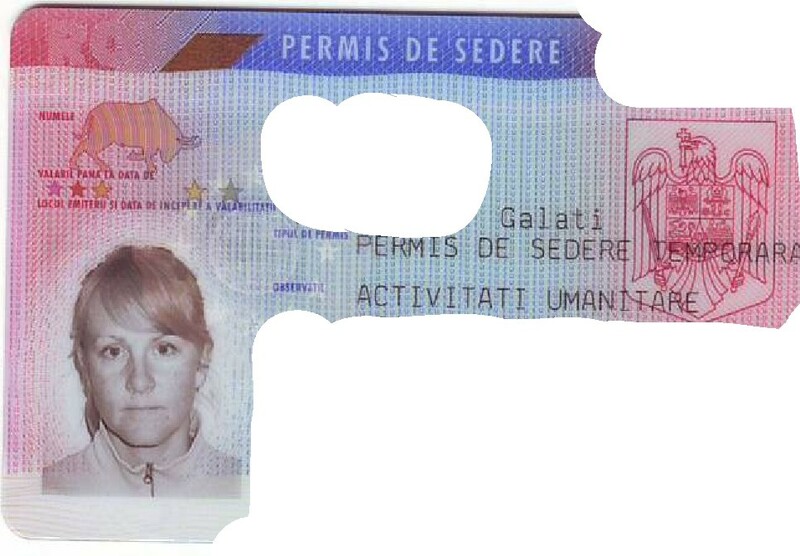 Since I married a Romanian citizen, this year I was eligible to apply for permanent residency. Which means I don't have to go through the hassle of applying for a visa every year. 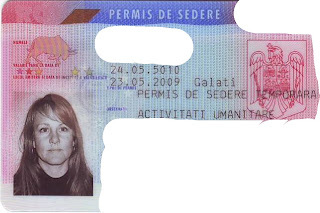 Which means that now seems like a good time to share the evolution of my residency card photos. First year. I sat down to have my picture taken and smiled big. The man taking my picture laughed OUT LOUD. Romanians don't usually smile in pictures. Not million dollar winning lottery ticket pictures. And definitely not ID pictures. So, I stopped the smile and just tried to sort of perk up my lips around the edges. I think I look sort of squeaky clean in this picture, you know? Wide-eyed, innocent, idealistic. I probably thought I'd show them all and try and smile for next years picture. This was the year when some of the other staff were having a contest to see who could win ugliest ID picture. I decided not to play. Really, I didn't. 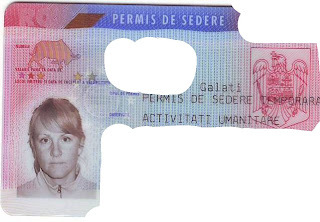 And this is my most recent attempt at achieving full-on Romaniancy (I just made that word up...)I'll carry it with me for the next 5 years because it won't expire until the year 2015. And certainly a contender for ugliest ID picture. Most of us on staff had a good laugh at it. Maybe because we all saw ourselves in this run-down-no-smiling-allowed photo and our progression from wet-behind-the-ears Americancy (yes, another made up word)to I've-left-it-all-behind-and-can't-smile-about-it culture adaptation. Sometimes, it's hard to smile at what we've left behind. There's grinning-and-bearing-it because we've given something up. Or, laughing-until-it-hurts because, honestly, it really does hurt to let go. To what we were. In order to embrace what we are. Where we are. I'm not embarrassed of this photo. I'll show it to you in person if you like. And not just because it's funny. But mostly, because in some backwards Kingdom way, it's lovely. Maybe one of the best pictures I've ever taken. All facades washed away. Just me. Not even trying to smile because I didn't feel like it. I was tired. It was Friday. Me, not trying to hide anything. What have you been trying to let go of? To read more, go to the Contemplation page for more of this Tuesday Unwrapped. So, If you haven't read this post yet, be sure to come back tomorrow! These daises are growing in the garden at the drop-in center. 73. My almost 63 year old mom who is wielding chain saws and daring to imagine her life differently. 74. Aunt Linda and Uncle Dean having Lexus. 75. Peonies and a husband who brings them to me. 77. Hearing from old friends. 82. the anticipation of a trip home. Activism:: A couple lines from the book Caretakers of Our Common House by Carol Lakey Hess. Who likes to draw me pictures...of me. And more often that not she gives me a side ponytail and chains on my jeans. But she also writes me little notes saying she loves me. Or hearts are left all over my daytimer. And I think of all the little girls I know. I think of how so many of them like to draw and color; sitting at a table for hours filling in lines, choosing colors, writing notes of dedication on the pages. And this little girl, she's just like all those others. It's sort of a sorority of drawing, a sisterhood of colors, a solidarity of beauty. Because that's exactly what they do. That's what this little one has done. Entered my world with her little girl love and given me drawings that line my heart with a beauty that is as deep and breathtaking as any celebrated artist. Even if I do have a side pontytail. So, I figure that this blog is getting around 100 hits a day. That doesn't mean that everyone stays who comes by (although I hope most do! ), still, if you do happen by, I want to hear from you...I'd love for you to interact with what I'm sharing and posting. So, share some love and leave a comment!!! Check out Contemplation for a bit from Frederick Buechner and Romanian Wifery for a bit from me. The flowers in the photos posted here today are courtesy of one little girl who loves to pick flowers for us on her way to the center. A couple weeks ago we were on our annual staff retreat in Lepsa. I've posted lots of pictures of this amazing place before so this time I decided to share some that are just a bit different. I was playing around with the settings on my camera, but I really like the effect I got on some of them. It was just my little point and shoot camera, but it didn't do half bad. Make sure to check out the Contemplation and Activism pages!!! Today in Contemplation I highlight a passage from The Brothers K and in Activism I direct you to a link about organic farming...so take a look! A couple weeks ago our community here at Cuvantul Intrupat (Word Made Flesh in Romanian) celebrated Bela and his 10 years of service. It was such a great evening as we ate Indian food, told funny Bela stories, watched videos made especially for him, and read letters written to him. We also gave him a gift: a DSLR camera that he'd been saving for and investigating the last 10 months or so. It was a joy to be able to surprise him with this gift...he never expected it! He also received an apron made just for him, the WMF bird in glass, and a t-shirt with a picture of our community on the back. Our dinner together...and the handsome man. Friends reading to him and presenting him with gifts they'd made. Anca got dressed up for the occasion. In other news, check out Contemplation for 1,000 gifts!